The woodwind family consists of three instruments that are played in elementary band, the Flute, the Clarinet, and the Alto Saxophone. Sound is made by blowing over the top of a flute, and by blowing into the reed of a clarinet or saxophone. These instruments are a part of the band program, along with those of the brass and percussion families. 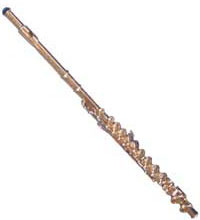 The Flute is a member of the woodwind family even though it´s made of metal. It´s the smallest instrument in the band and easily fits into backpack or locker. While most Clarinets are made of plastic, professional clarinets are made of wood. 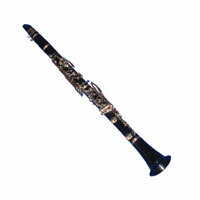 The clarinet is slightly larger than a flute but it is still a small instrument to carry. Making a sound on the clarinet is fairly easy. It´s also a good instrument for students who haven´t developed a strong sense of pitch or have difficulty singing the correct notes. The largest member of the woodwind family is the Saxophone. 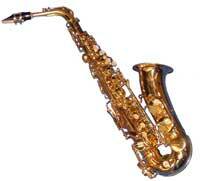 Saxophones, which are made of metal, come in four sizes. The appropriate size for beginners is called the "alto" saxophone.